ishwish is communication from the universe, using vibration in the auditory and visual frequency spectrum to transmit a message of peace, harmony and universal knowledge for all people of planet Earth. Multi-instrumentalist and sound designer Christopher Currell has worked with diverse artists such as Quincy Jones, Paul Simon and Stevie Wonder. His pioneering work with the Synclavier (a sophisticated digital synthesis computer) culminated in his contribution to the multi-platinum album "Bad" by Michael Jackson. Christopher's current work with ishwish is a reflection of new knowledge of reality discovered in quantum physics...that EVERYTHING in the universe is connected. On this first ishwish venture, Cirque du Soleil vocalist Beth Quist joins Christopher to explore and unleash latent memory stored in our DNA via sound vibrations. Christopher's sonic textures along with Quist's angelic voice combine with the influence of the listener and environment to open our hearts and memories of our distant past. "The sound vibrations of ishwish are intended to be a journey through the universe, different times and dimensions. The journey ultimately begins and ends with you. Please enjoy!" License Transcendent ambient vibrations by Ishwish for your project. 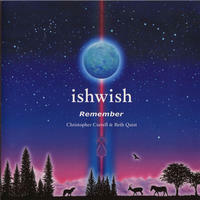 Play the music of Ishwish in your restaurant or store. A New Age Has Begun by To Life! : Music as a journey through tribal landscapes, rhythmic dance, hypnotic trance.